As refrigeration is quite simply the transfer of heat from one area to another using mechanical means, it is important to realize the sources of that heat in order to reduce its origin and therefore refrigeration plant run-time. 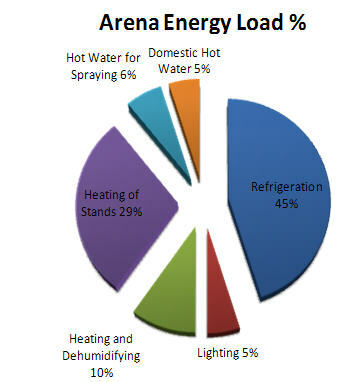 As seen in this diagram, refrigeration represents the most significant energy load (45%) in an arena. In order to better understand savings measures in an arena, it is useful to assess the energy needs of the refrigeration system. Approximately 28% of the total cooling load in a typical ice arena or curling rink is due to infrared radiation.This is the area which we are reducing through the installation of an ASTRO-RINK ceiling. Lowering the temperature at the ceiling can reduce the ceiling radiant heat load. This may be accomplished by keeping warm air away from the ceiling, by increasing the roof insulation, and significantly by lowering the emissivity of the ceiling material to shield the ice from the building structure. Ceiling, roof materials and exposed structural members have an emissivity that may be as high as 0.9. Special aluminium paint can lower the emissivity to between 0.5 (50%) and 0.2. Polished metal such as polished aluminium or aluminium foil has an emissivity of 0.05. Also, because a low-emissivity ceiling is cooled very little by radiant loss, most of the time its temperature remains above the dew point of the rink air, so condensation and dripping is substantially reduced or eliminated. An ASTRO-FOIL Low-emissivity ceiling can be incorporated into new and existing rinks in order to reduce radiation loads, eliminate condensation problems and reduce the overall lighting requirements, making your rink more energy efficient, while at the same time enhancing its look. Copyright �2007 Energie Innovation Inc. All rights reserved.